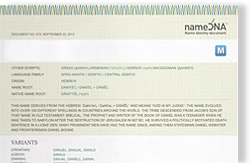 This name derives from the Hebrew “dânı̂yê'l / dâni'êl > Dānīēl“, meaning “God is my judge”. The name evolved into over 100 different spellings in countries around the world. The tribe descended from Jacob's son of that name in Old Testament. Biblical: the prophet and writer of the book of Daniel was a teenager when he was taken to Babylon after the destruction of Jerusalem in 607 BC. He survived a politically motivated death sentence in a lions' den. Many prominent men have had the name since, among them statesman Daniel Webster and frontiersman Daniel Boone.